Sideswipe Accidents → What is a Sideswipe Collision? If you’ve been driving on Texas roads long enough, you’ve likely seen cars with scrapes, dents, and missing trim all along the side. Chances are, these cars were involved in some type of sideswipe accident. 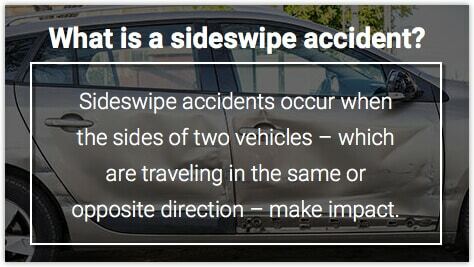 Sideswipe accidents occur when the sides of two vehicles – which are traveling in the same or opposite direction – make impact. The two vehicles make contact, usually when one driver tries to make a lane change and doesn’t see that there’s another car in his blind spot. Other times, sideswipe accidents occur when a distracted, tired, or careless driver drifts into another lane and hits the other car. What causes sideswipe car accidents? While many sideswipe accidents only cause property damage, including unsightly scratches and jammed doors, many other sideswipe accidents can be deadly, especially those when the cars are both traveling at a high rate of speed. Sideswipe accidents on an interstate highway can be deadly, because the reaction of many drivers is to immediately correct their action or move away from the car that is impacting them. Often, this knee-jerk reaction causes the driver to jerk the wheel and lose control, causing head-on or rear-end collisions, and in the worst scenarios, the car to flip over. These types of accidents are notorious for making drivers collide with other objects, too. When trying to get away from the vehicle that’s impacting them, they often crash against other vehicles, guardrails, trees, road signs, barriers, barrels, and light posts. Typically, the person who failed to look for their blind spot or who veers into the other driver’s lane is to blame for the accident. But because many of these accidents take place at high rates of speed, on the highway or other two-lane roads, it can be difficult to determine blame if the two drivers give conflicting accounts of who drifted into the other person’s lane. This is when it becomes critical to have a seasoned accident investigator or legal professional to look carefully at all of the evidence involved in the crash to assign blame. In Texas, all traffic accidents resulting in personal injury, death, and property damage in excess of $1,000 are required to go through an accident investigation process and for official traffic accident reports. Because sideswipe accidents often appear to cause minimal damages, police officers oftentimes don’t go through the entire investigation process. Likewise, insurance companies can find it easy to dispute a claim in a sideswipe accident due to the lack evidence to substantiate the claim. An experienced Houston car accident lawyer can help you reconstruct your accident and formulate an argument that can get you the compensation you deserve. Over-steering and under-steering while going around steep curves can also cause a sideswipe accident. According to data from the Insurance Institute of Highway Safety (IIHS), 242,000 sideswipe crashes occur every year. Sideswipe accidents cause about 27,000 injuries and more than 2,500 fatalities each year. Opposite direction sideswipes occur more frequently than same direction sideswipes. Who is at Fault in a Changing Lanes Car Accident?